Article: LJ Benet Looked Super Dandy At The Miss Me And Cosmopolitan Spring Campaign Launch Hosted By Bella Thorne! The wonderful LJ Benet is known for many things: being a terrific actor, a wonderful singer and always having one incredible sense of style at every event he goes to! 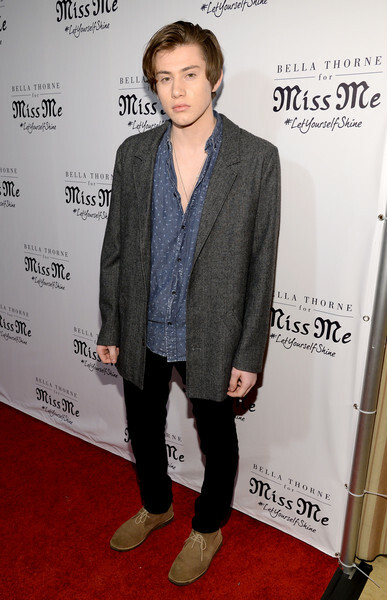 The terrific LJ Benet looked super dandy as he attended the Miss Me and Cosmopolitan Spring Campaign Launch event hosted by Bella Thorne yesterday, February 3, 2016 at The Terrace at the Sunset Tower Hotel in Los Angeles, California. LJ Benet looked magnificent rocking his great event attire as he posed for photographers on the red carpet of the event. Check out more photos below of the amazing LJ Benet at the Miss Me and Cosmopolitan Spring Campaign Launch event! I’m glad LJ Benet had a blast at the event! Previous Article: Kelli Berglund Looked Extraordinary At The Miss Me And Cosmopolitan Spring Campaign Launch Hosted By Bella Thorne! Next Article: Bella Thorne Looked So Stunning As She Hosted The Miss Me And Cosmopolitan Spring Campaign Launch Event!